A weekday generally starts as early as 7 in the morning, preparing breakfast and lunch, taking a shower, having your food and reaching office by 9 am. After an entire day of work, coming back home and then again thinking what to prepare for dinner is like a capital punishment. The pain of thinking what-to-cook for dinner tonight kills my little energy for cooking, so I always plan ahead. Weeknight dinners are never that pompous, the best way to make your tongue and tummy both happy is to have a casserole preparation- doesn’t take much time, and tastes great. With the constant pestering from friends and family, I finally started reducing my carbohydrate content (but, that doesn’t mean I left having rasogollas :)), anyways a bowl of brown rice couple of times a week is fine with me. But, still shifting from the fine white rice to the sticky brown rice is a little jump on my side. So, the other night I thought of preparing my brown rice a little differently. 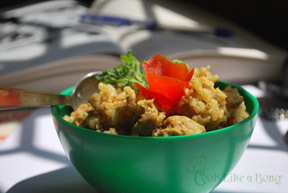 Searching for brown rice recipes, I came across one which had Mexican style brown rice preparation. The preparation was with boneless chicken, but as I am on a strict vegetarian diet at present, I thought of replacing the chicken pieces with soya bean chunks and making it a little spicier to suite the Bengali tongue of mine. I prepared it on gas oven, but if you are too lazy even to click on the burner, you can try this recipe in a microwave. Just follow the instructions mentioned in the microwave fried rice recipe. Put in the soya bean chunks along with the vegetables. Bring mixture to a boil, then reduce heat to low. Simmer, covered, for 20 to 25 minutes or until the broth is absorbed. Hot Tip – You can add vegetables of your choice, and have it with spicy chicken curry.